Another show season is fast approaching and we can’t wait to see what it will bring. We will again be having a payback event with $ added for the September show. We do have a few items to address before the season begins to help make the season run smoothly. 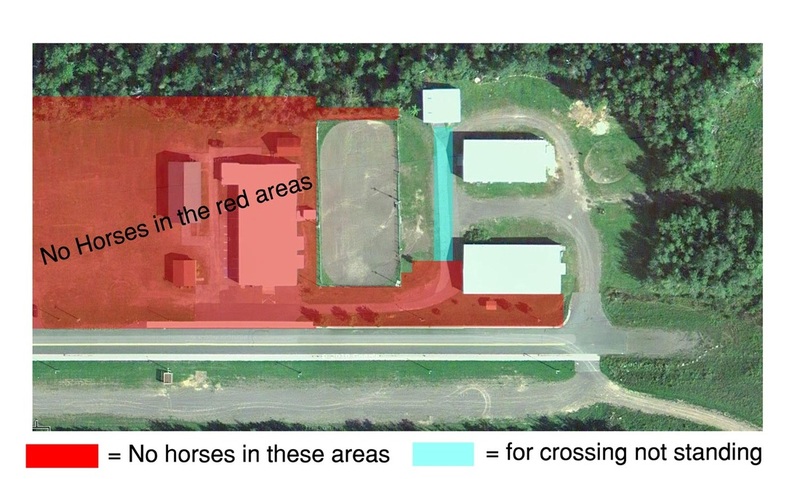 Many of you already know that horses are not allowed in certain areas on the lake county grounds and it is indicated on the map below. Please take some time to look at the map as we are under contract to say out of those areas and damages done by hoof prints could result in us loosing our privileges to use the fairgrounds for future shows. Also everyone needs to clean up all horse manure even if it’s not yours, wheel barrows and the proper utensils are left out at each show to allow for easy pick-up. Just one more thing our shows run on volunteers running our gate, helping in the announcing stand and setting up each event. Last year there were several people who stepped up to help and they couldn’t be thanked enough. We need added help this year to make things run as smoothly and timely as possible for another successful show season. If you are wondering how you can help feel free to contact us or just ask at any of the shows this year. Thanks again and we’ll see you all soon! Attendance: Autumn Chida, Jessica Bockovich, Megan Timm, Steph LeBlanc, Kristin Napper, Kelly Heller, Cathy Butler, Viola Hanson, Audrey Hanson, Mackenzie Vatalaro, & Tammy Vatalaro. The meeting went very well. We have basically everything figured out for the May 12th - fundraiser play-day. We have not yet scheduled another meeting as it might not be necessary before the May 12th show. · Arena Rental Fees will be $50 per show with a $500 damage deposit. Club Name: Reigning Riders S.C.
Year End High Point Award: Certificate for a custom bridle by Silver Star Creek Custom will be awarded to the highpoint earner in each age class. 1st Show Committee: Jakki O, Cathy B, Steph L, Kristin N & Jessica B – will be the show committee for the 1st show June 10th. Jan Lillis & Susan Napper will be in the announcer stand for the June 10th show. By-Laws: Addendum – Finances at the end of each show is to be counted and verified by a minimum of 2 saddle club officers. Equipment: Cathy Butler being the last President for the Renegade Riders Saddle Club stated that the everything owned including equipment would be passed onto Reigning Riders Saddle Club. Show start: Registration will open at 8:00 a.m. and the shows will start at 9:00 a.m.
Concession: Jakki said she would talk to the 4-H about possibly doing concession for the shows. But we are planning on bringing beverages that will be available for a suggested donation amount. Next Meeting: We are planning on having the next meeting at Jessica Bockovich’s house in Silver Bay – 4740 Highway 3, Silver Bay (218-226-9946) @ 6:30 p.m. – Bring your unwanted ribbons/ trophies to be able to re-use them for the younger kids to help cut the costs for the first show.